Be My Guest…Writer, that is! As a former child/adolescent psych RN and mother of a child with apraxia of speech (CAS), I gravitated toward this book for several reasons. But one that stands out is that I have a friend raising a son with mild-moderate hearing loss. Four years ago, they didn’t understand why he failed his newborn hearing test. Several years (and hearing aids later), they now have a much greater understanding of hearing loss in infants and children, the slower language acquisition, as well as the benefits of early intervention (EI). Plus, they have an amazing 4 year old who is making strides in social and academic settings; he’s not much different than any other preschooler. Authors and researchers Spencer and Koester have culled the research for you, placing it between two covers and making the world of hearing impaired and deaf infants and toddlers more accessible. NURTURING LANGUAGE & LEARNING: Development of Deaf & Hard-of-Hearing Infants & Toddlers is a wealth of information on “typical” infant-toddler development, paired with struggles of the child with hearing impairments. What might be different for a parent and child if hearing, a vital sense is affected? Spencer and Koester will show you through various examples and research. Today, I am honored to have Patricia Spencer and Lynne Koester talk with us about the challenges faced by child and parent when hearing is compromised. Leslie Lindsay: Thank you for popping by today, Pat and Lynne. I am absolutely amazed at the wealth of knowledge poured into NURTURING LANGUAGE & LEARNING: Development of Deaf & Hard-of-Hearing Infants & Toddlers. Bravo! Can you tell us what inspired you to write this book, and who is your intended audience? Pat Spencer: Our goal was to create a kind of “handbook” for parents whose little ones are identified to have hearing loss either at birth or during the early months and years of life. What developmental accomplishments can be expected? Which ones remain special challenges? What can parents do to best encourage and support these accomplishments? We even put together a series of lists of developmental steps that might be expected at different ages, noting when limits to hearing (or to vision) present special challenges. Despite remaining challenges, we wanted to emphasize the great progress that is being made by so many deaf and hard-of-hearing infants and toddlers. We have included stories about the relatively large proportion of young children with limited hearing who have multiple disabilities. These children can also make much more developmental progress than in the past—but supportive early intervention services are required. Lynne Koester: Much of our writing together in the past has been primarily for academic audience, and we felt it was time for some of the “scientific” information to be made more accessible to parents and professionals involved directly with children in the early years. We also wanted to highlight – through vignettes at the beginning of many chapters — some of the cultural and economic variations that can have important influences on the development of children with any kind of disability. The progress being made depends on availability of supportive services, but early identification, early intervention, and even appropriate educational practices are still not available in many parts of the world. L.L. : As much as we want our children to be exceptional, we are often saddled with things that aren’t so-perfect. My oldest daughter suffered from childhood apraxia of speech (CAS) when she was younger. I have other friends who have children with Down’s syndrome, Cru di Chat, AD/HD, and mild-moderate hearing loss. What might you advise parents who are grieving the loss of the so-called “perfect” child? Pat Spencer: Just as each infant and toddler is unique, so is each parent. We bring our own experiences and personalities, as well as our expectations of what our children will be like, to our roles as parents. When our little one doesn’t act in the way we expect—or, importantly, when we have been led to believe that he or she faces overwhelming barriers—we can be thrown off kilter. We worry whether we can be “the right kind” of parent for this baby…and fears about our babies’ challenges can lead to some pretty devastating parental emotional reactions. We want to emphasize, however, that this is not always the case. It is most important, however, that a parent reach out to others—family members, friends, their intervention specialist—if he or she feels overwhelmed, becomes unusually sad, begins to withdraw from others, or even no longer finds that playing with or cuddling the little one is rewarding. The intervention team should make sure that emotional support from a professional such as a social worker or a psychologist is obtained…whatever helps the parent, also very directly helps the baby. Lynne Koester: […]social and emotional development are just as important to the overall health of any child as are advances in other realms (intellectual, language, physical, etc.). L.L. : Full-disclosure: Our first-born failed her newborn screening test for hearing. As a new mom, I was puzzled. The nurse explained that there are sometimes false positives and recommended we re-test in a week or two. Her hearing was just fine when we returned. Still, it caused alarm. How do those newborn screening tests work and why are they important? Pat Spencer Hearing screening(the newborn test) essentially asks “Does she respond to these sounds the way we expect for her age? If not, let’s wait awhile and test again.” Results of the screening can be thrown off by fluid or other material in the baby’s middle or inner ear for some hours or days after birth. Or, screening findings can be influenced if the baby moves around or is crying. As a result, it is not uncommon for a baby to be referred for further testing but turn out to have no hearing loss at all. When screening for most things, we would rather miss by over-referring for further testing than miss by under-referring. This is certainly true for infant hearing loss. Why? Good data—piles of information—show us that finding limits to hearing early, if early intervention services are then provided, it really promotes developing language, thinking skills, even social and emotional abilities…faster, more complete, more easily than if support for development doesn’t happen until later. It can be really scary for the parents of a newborn to be told “more testing needed.” We don’t mean to downplay the anxiety…but the benefits of finding those who are deaf or hard of hearing are so great. L.L. : As with hearing issues (deafness/hard-of-hearing/loss) in newborns, I am sure the causes vary. Can you speak to that please? Pat Spencer: Currently, about half of newborn or early hearing loss is “genetic,” resulting from different patterns in a baby’s chromosomes or genes. These patterns can be “recessive” and “hidden” for generations; others are “dominant” and tend to show up generation after generation. Some tend to cause hearing loss only, while others (for example, Alport or Usher Syndromes) present with disabilities in multiple areas. 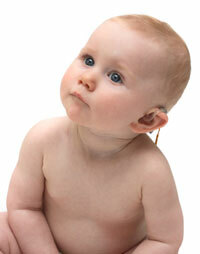 In some cases, the hearing loss is not present at birth but occurs over the first few years. In perhaps another quarter of cases, illness is thought to have caused loss of hearing. Sometimes it is an illness the mother has during pregnancy. These include viruses like CMV (cytomegalovirus) and (in parts of the world where vaccinations are not common) rubella or German measles. Some viral diseases can be so mild in the mother-to-be that she doesn’t even know she has been sick. Infants and toddlers can also contract illnesses after birth that can affect hearing—for example, viral meningitis. Certain types of antibiotics, which may be needed to save a baby’s life, can cause loss of hearing. In addition, birth trauma, prematurity, breathing problems, and even severe jaundice can—but do not always—result in hearing loss. Medical and genetic specialists are still unable to identify the cause of hearing loss in about a fourth of cases. Knowing what caused limited hearing can help us predict special challenges that will be faced—and occasionally how we can best address them. However, in many cases, knowing the cause doesn’t tell us how a baby will progress. Even babies with the same identified cause have great individual differences in how they can best learn and the paths they take developmentally. L.L. : What specific challenges does a parent of a child with deafness (or hard-of-hearing) encounter on a daily basis? Can you provide a few examples of how a parent may successfully overcome some of those? Pat Spencer: Many parents report that the biggest challenge is having enough time–Time for visits to doctors and audiologists, time for home visits from the early intervention specialists, and time for other children or family members. All this in addition to all the time that any baby or toddler requires! The primary concern for parents of a deaf or hard-of-hearing baby is how to best support communication and language skills. We emphasize in the book (based on solid research) that if there are no other developmental challenges, hearing loss should not delay basic communication skills. These include expressing emotion, gesturing, actions with toys and other objects. Learning language is, however, a different matter and requires that babies and toddlers have an accessible language model used in their daily activities. This can be language received through vision (sign language or cued speech) or through hearing, using a hearing aid or cochlear implant. Many deaf and hard-of-hearing children benefit from combining both approaches. L.L. : I understand early intervention is highly recommended. 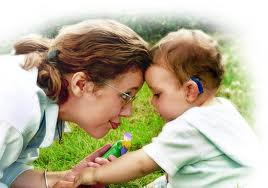 The sooner a child is fitted with a hearing aid, the better. Can you describe what that process looks like? Pat Spencer: Younger brains are more flexible and much early learning is supported by naturally-occurring, everyday experiences. (Later, more structured activities may be required.) Babies learn how to use their hearing better if they begin wearing a hearing aid before rather than after 6 months of age….and 3 months seems even better. This also prevents them from falling farther behind on listening experience. For the baby, getting a hearing aid tuned up and in the ear is easy; it doesn’t hurt! It is not so easy, however, for the audiologist (hearing specialist). Special training and experience working with babies is necessary. Parents need to be directly involved in the process, too: making sure the hearing aid is actually worn, and reporting to the audiologist how the baby reacts to sounds during daily activities. Parents may respond to special questionnaires to help the audiologist know whether the aid is increasing various sounds as best possible. Repeated audiology visits will be required to monitor the effectiveness of the hearing aid over time. Hearing aids aren’t magic. They often don’t provide full access to sounds, especially when the hearing loss is severe. Although the technology continues to advance, sounds received through them may be distorted—and it is especially difficult to hear clearly when in a noisy situation. These are some of the reasons that signs or cued speech are also often used with deaf and hard-of-hearing infants and toddlers. L.L. : But early intervention is more than “just” a hearing aid. It may involve parent education and support, small group work, and more. Yet, it seems state funding for such programs are decreasing. What might parents do to ensure their child (and themselves!) receive the supportive programs they need? Pat Spencer: Federal legislation, Part C of the IDEA (Individuals with Disabilities Education Act), extended intervention services down in age to birth to 3 years. These services are to be available to all little ones with developmental delay or “potential for developmental delay” due to physical, cognitive, or medical issues. The definition of “developmental delay” is made at each state level, however, so parents need to find out what is available in their own state. Intervention services should be in place by the time an infant is 6 months old. A team of professionals should be involved, including a case manager or primary intervention specialist who is trained and knowledgeable about little ones with limited hearing. Services should be provided to the family as a whole and not focus on the child in isolation. Parents may have to advocate for their child’s needs. Current information about recommended services is available from the American Speech Language and Hearing Association. Parent organizations, such as Hands and Voices can be helpful . The CHIP (Colorado Home Intervention Program,) provides a model for proven high quality services for deaf or hard-of-hearing infants and toddlers. In addition, Dr. Marilyn Sass-Lehrer’s new book “Early Intervention for Deaf and Hard-of Hearing Infants, Toddlers, and their Families: Interdisciplinary Perspectives” is a good resource about recommended services. L.L. : Is there anything I may have forgotten to ask that you’d like to share? Pat Spencer: The impact of warm, responsive interactions between parents or caregivers and young children cannot be over emphasized. Many of the skills and behaviors that most adults “intuitively” use with little ones seem amazingly well designed to support their development…development of social and emotional abilities as well as motor (or physical), visual attention, communication, and language abilities. We tend to use lots of sensory channels during interactions (holding and cuddling, crooning, smiling and nodding in rhythm with the baby’s movements), an we tend to show and direct attention to toys and people, while assuming that the baby’s behaviors have meaning and responding to that meaning. These kinds of experiences provide the base from which later skills will develop regardless of the baby’s hearing abilities. Parents should recognize the power of these naturally-occurring behaviors…perhaps increasing some of them as their individual baby or toddler shows them what is working best, what is most appealing or engaging. Despite remaining challenges for deaf and hard-of-hearing infants and toddlers (and their parents), great progress continues to be made. L.L. : Thank you so very much for this very important book and for taking the time to chat with us, Patricia and Lynne. Patricia and Lynne: Best wishes and congratulations on all you are contributing. For more information, please take a look at Oxford University Press’s page. Patricia Elizabeth Spencer, Ph.D. has been a teacher, assessment specialist, and educational advocate for deaf and hard-of-hearing students (including those with multiple learning challenges) across the age range of infancy through post-graduate levels. Her work at the Gallaudet Research Institute focused on early interaction, play, and language development. She has worked internationally as a researcher and educational consultant and has written extensively on issues related to development and education of deaf and hard-of-hearing children. Lynne Sanford Koester retired after 25 years of teaching developmental psychology at the University of Montana and at the University of North Carolina-Greensboro. She has also worked in Ethiopia, Austria, and Germany, and is the former Director of the Intercultural Youth and Family Development graduate program at her university. Her research has focused primarily on infant development within the family context – parenting behaviors and cultural influences, early parent-child interactions, and intuitive parenting.